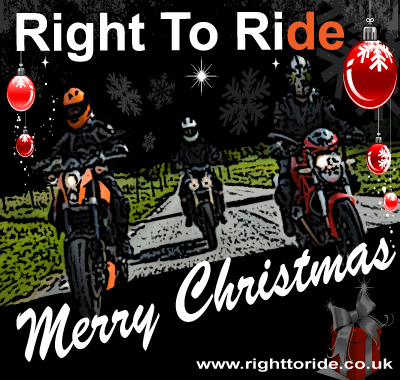 A big thank you from Elaine and myself at Right To Ride to all our individual – club and business supporters and those who have received our updates and news in 2010. To all those who have helped throughout the year in our work, to promote and protect that collective lump of metal, rubber and plastic that we could not live without – the motorcycle – and all that it means as part of our way of life. Finally, to those who have patiently listened to our explanations about why motorcycling is such an important part of the lives of millions of people. Merry Christmas, a Happy New Year and Safe Riding in 2011.